A new school year is about to get underway, and with that comes the start of school athletics. Football season practices have already started and games are right around the corner, and basketball, wrestling, lacrosse, baseball, and golf seasons will be here before you know it. Gearing up for any sporting season is full of excitement and anticipation, and while it is fun to look forward to receiving a new jersey and getting all of your child’s equipment ready, it is vitally important to remember that your child’s teeth need to be protected during any physical contact sport. During the 2016-2017 school year, there will be upwards of 15 million children who participate in a contact sport. Of these 15 million children, approximately ten percent will suffer from a mouth-related injury. 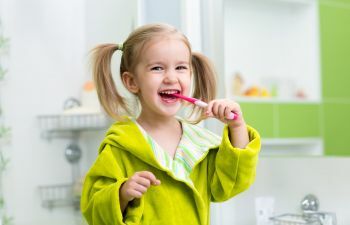 Protecting your child’s teeth is extremely important because of the lasting, permanent damage that can be caused by any type of blow to the face. A protective mouth guard is a piece of equipment that parents and their children should never overlook. A protective mouth guard protects the teeth from trauma and injury if contact with the mouth were to occur. While there are over-the-counter options available for people to take home and “boil and bite” a mouth guard, this is never an ideal option. There is no such thing as a one-size-fits-all mouth guard because every single mouth is different. An ill-fitting mouth guard is uncomfortable, ineffective, and can cause distractions to the participant. Custom mouth guards made at the dentist are the most ideal option for protecting your child’s teeth during sports. Custom mouth guards will comfortably fit every groove and curvature of the mouth so that they fit properly, allowing your child to breathe easily, speak, and not be distracted by wearing them. At Gold Hill Dentistry, we want to partner with parents to help protect their children’s smiles. Taking the proper measure of having a custom mouth guard fabricated for your child can protect his or her teeth from permanent damage. Call us today to schedule an appointment for a custom mouth guard. We gladly accept dental insurance and offer in-house financing and CareCredit.